It’s time to goodbye to summer. Fall officially arrived a week ago. New York State now awaits, delivering opportunities for leaf-peeping, autumn events, and tranquil fall getaways. Unwind and soak up the crisp weather before the temperature drops. Here are two perfect fall getaway hotels to put on your radar in case you’re looking for an ideal fall getaway. Therefore we are happy to share information about two luxury hotels. The first is the Maison Vivienne in Southampton. The second property is The Adelphi Hotel in Saratoga Springs. Celebrate autumn in Southampton with Maison Vivienne’s special dine and stay experience. The newly opened Inn and Restaurant is offering special seasonal menu offerings from Chef de Cuisine Christian Souvenir. Maison Vivienne is an elegantly modern destination located in a 17th century Dutch Colonial building. The hotel accommodates nine rooms with two suites. In addition, there’s a spacious dining room with cathedral ceilings. Plus you can relax by the two fireplaces and socialize in a cozy bar. 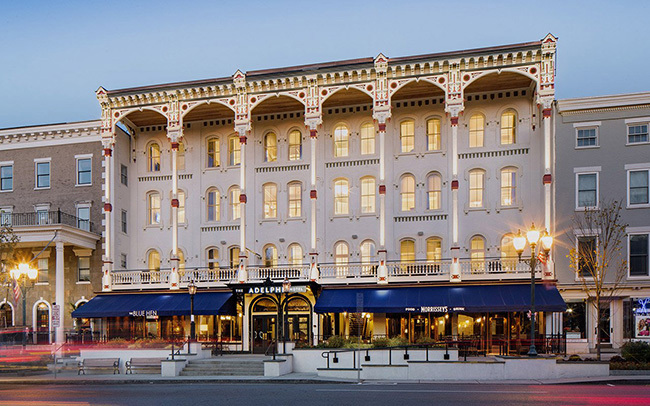 The Adelphi Hotel in Saratoga Springs invites guests to visit this fall season. Perfect for a weekend getaway, visitors can view the vibrant foliage in Saratoga Spa State Park. For example, go apple picking at a nearby local farm, or discover a new band at Caffe Lena. It’s proud to be the oldest continually running coffee house in the U.S. Originally built in 1877. The Adelphi Hotel boasts of a vivid, modern reimagining of classic Victorian luxury. The hotel reopened in 2017 after a five-year renovation. Chef David Burke is the property’s Culinary Director. As such, the hotel centers itself on vibrant, contemporary dining options. In addition, try The Blue Hen, Morrisey’s Lounge, as well as the adjacent Salt & Char. While in New York state, be sure to check out the amazing fall foliage. This time of year, the landscape comes alive with vibrant colors. Consider a scenic drive through Hudson Valley, the Catskills, the Adirondacks and then up to the Finger Lakes area. You will definitely be surrounded by nature at its very best. Interested in visiting New York state? Please contact us today. We hope you enjoyed reading about spending fall in New York State. Our travel specialists are ready to assist with any luxury travel plan you may have. Return to follow our luxury blog. ← “Cosmic X” Experience from Artist Jack Armstrong Comes to New York City!